Richard Gere can certainly carry any kind of film. He has the looks, the cool, the seniority, to be placed in the heart of a story and wait for it to unfold around him. He does this here, only that he also becomes the victim, his slightly dodgy business practices – while being well-intended (it’s Richard Gere, after all!) – and his not always perfectly correct private endeavors at some point come together, and unravel his world. He has to deal with the fact that even he, the infallible juggler of Wall Street and Main Street, is a mere mortal, and that making mistakes is a reality even for him. 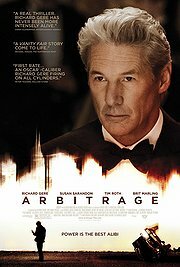 I lived off Richard Gere’s blood in this film, trying hard to ignore the not very interesting cascade of business domino stones falling over, and trying very hard to ignore the even less interesting private shananigans that drive the drama. To be perfectly honest, I struggled a bit with the way he was positioned here, though: While he may look like the perfect entrepreneur and perfect family performer, it all plays too well into the Gere-cliches. I was waiting for surprises that derail the film from its straightforward track, but there were none to be found. While looking slick and being played with confidence on part of everybody involved (Susan Sarandon does what she needs to do, and I am glad to see Tim Roth again after a while), what pretends to be a thriller of sorts did not feel like one.